BAODING, China (Reuters) -- The giant orange robotic arms that swiftly weld together car frames at the Great Wall Motors factory in Baoding might seem like the perfect answer to China's fast-rising labor costs -- they don't ask for a raise, get injured or go on strike. "You don't have to be an expert see the (quality) gap between Chinese cars and those made by companies like Audi and Volkswagen," said Li Shaohui, who oversees automatic control engineering for the company. "To beat those competitors we have no choice but to use a higher level of equipment and technology." 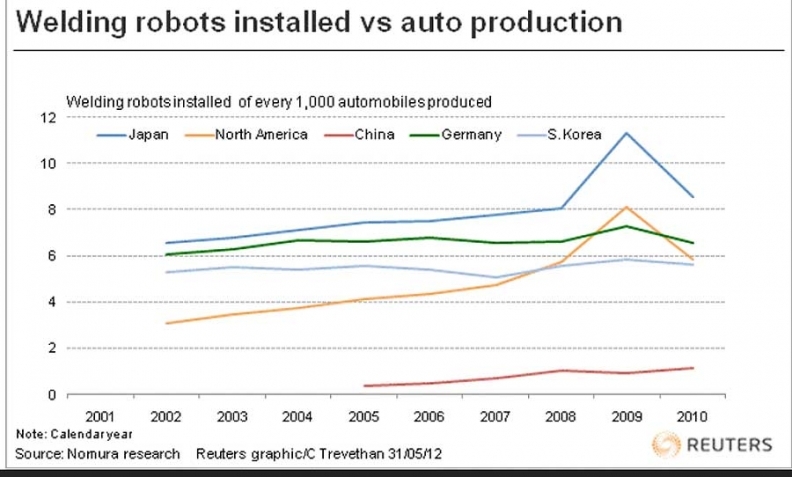 From car plants to microchip foundries, China's industrial sector increasingly runs by machine. According to Nomura, 28 percent of factory machines in China use numerical controls -- one measure of automation. That may be far lower than Japan's 83 percent, but China is growing far faster than Japan did at a comparable stage of development, says Ge Wenjie, a machinery analyst with Nomura. One of the biggest could be Foxconn Technology Group, maker of products for tech giant Apple, which is talking of plans to put a million robots in its factories. The army of cheap laborers that made China a manufacturing powerhouse is neither as vast as once thought nor as cheap as it was. In response, manufacturers have been spending heavily on machines that will both make them more productive and let them churn out higher quality goods. That change will pose a growing challenge for U.S., European and Japanese industrial companies not used to competing with Chinese firms in the high-end segments of their markets. "You will see foreign players facing more and more pressure from leading local manufacturers upgrading their products, their quality and their scale," said Raymond Tsang, a China-based partner with consultancy Bain. Great Wall has seen some early success with it own efforts to take on the global brands. The company's solidly built Haval SUV and cheerfully named Wingle pickup truck have gained a foothold in Australia, where they sell for about half the price of comparable Japanese models. Four of its models became the first Chinese cars to pass Europe's safety and emissions requirements, though they aren't yet on sale there. Automation doesn't come cheap. A factory floor robot of the kind in Great Wall's plant costs about 4 million Japanese yen ($50,760) according to Ge of Nomura, and a production line might easily have 100 of them. There is also the cost of downtime, when machines need to be maintained or adjusted to handle new products. For years, low wages meant automation was simply not worth the expense. A company didn't need to buy a packaging machine when it was cheaper to hire a room full of workers to do the same thing. But steady cost rises are tilting the balance in favor of machines. Last year, urban labor costs in China increased 12.3 percent in inflation-adjusted terms for private companies, which face a worsening labor shortage. "Everyone is doing this because there's tremendous competition in China and the cost of raw materials is going up and wages are going up," said Andy Rothman, an economist with CLSA in Hong Kong. "So really, the only way that most companies can survive is to raise productivity and the best way to do that here is to add a little bit more equipment." The demand for higher quality also weighs in favor of automation. An engine block built by a worker positioning the drill by hand won't be as good -- or sell for as much money -- as one fashioned by machine. "The big driver (for automation) is quality and consistency, especially for high tech," said Bain's Tsang. "For Chinese players to compete globally, they have to reach certain standards and be certified by their customers -- automation is necessary to improve the quality." The government sees that too. It has made industrial upgrading one of the key priorities of its latest five year plan, alongside rebalancing the economy toward greater domestic consumption. That has led Beijing to pour billions of dollars into strategic industries like clean energy and high-speed rail and to encourage imports of advanced machinery. Still, it will be years before the lonely, fully automated production lines of high-end Japanese manufacturers are common in China. Its workforce remains huge and, even with inflation, dramatically cheaper than Japan's or Germany's. "In China, we'll see things become much more automated than they are now, but I don't think it will ever be like Japan. There are just too many people in China," said Ge. Among companies making the big shift to automation is Foxconn, whose chairman Terry Gou said last summer the firm would put up to 1 million robots in its massive Chinese factories over three years. In Foxconn's case, the step follows not just rising labor costs but also a string of worker suicides and allegations of poor working conditions. Surging demand for automation is a boon for makers of such equipment as sensors, frequency converters, conveyor belts, pneumatic systems. Mitsubishi Electric Corp., which like Switzerland's ABB Ltd., Japan's Fanuc and others supplies such devices to China, sees sales there rising from 60 billion yen ($762 million) in 2011 to 100 billion yen by 2015, according to Masaki Shiroshita, president of Mitsubishi Electric Automation Ltd. The trend will also affect the broader economy. Despite China's manufacturing prowess, its productivity is strikingly low. The average U.S. worker in a goods-producing job produces $84,580 worth of exports compared with just $5,228 for a Chinese worker, according to consulting firm High Frequency Economics. That gap -- a ratio of 16 to 1 -- is partly explained by the higher-value items made in U.S. factories, but also by the heavy application of capital and technology. "Automation and mechanization is an incredibly important driver of productivity increase," said Louis Kuijs, an economist with the Fung Global Institute in Hong Kong. "There is huge scope for China to get more productivity out of its workers by doing this upgrading." China's investment levels are high in international terms -- manufacturing investment reached 10.3 trillion yuan ($1.6 trillion) last year, up 31.8 percent from 2010 -- with much of the spending resulting in newer, better factories. "What you're seeing is a really high level of investment in Chinese manufacturing, but most of this is not going to expanding capacity. It's making the workers more efficient," said Rothman. "The small private firms that I visit around the country, they're still a bunch of guys in T-shirts banging on metal with rock. So they can invest in machinery and move up the value chain. I think there's a long way to go for that in China."